That’s the reaction some parents could have if a well-meaning friend or relative gave their child Do I Have to Say Hello by Delia Ephron, author, playwright, and screenwriter of You’ve Got Mail and Sisterhood of the Traveling Pants. While the pre-holiday release date likely indicates that the publishers saw this as a gift book, really Do I Have to Say Hello is a great book for parents to purchase to read with their own child. With clever humor and illustrations both reminiscent of Roald Dahl, Do I Have to Say Hello teaches the basics of good manners and polite behavior to children in an entertaining way. 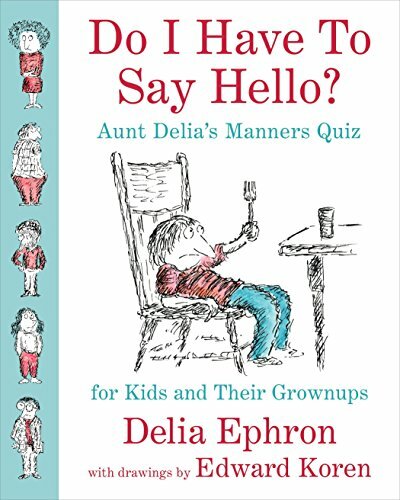 From good table manners, to how to behave at a birthday party, to dealing with the addictive lure of video games, Ephron lays the groundwork of how to properly communicate with both adults and friends and basically how to be a good person. Though it’s possible older kids will be interested in reading because of the humor and the funny illustrations, this book seems more appropriate for the four- to ten-year-old set, who are still eager to sit and read a book with Mom or Dad. Because the topics are widespread, one could pick and choose a few at a time and use the questions and answers to inspire discussion about situations in one’s own lives. In a time when rudeness in social media and politics has unfortunately become the norm, Ephron’s book is a well-intentioned and well-crafted attempt to impart to our next generation the knowledge of good manners and polite behavior.